Watch all of the Country Music Mean Tweet editions in one spot and pick your favorite edition. Jimmy Kimmel’s Country Music Mean Tweets features hilarious and crazy comments from Country Music fans being read by the Country Music artists and Country bands. Country music is known to have some of the most loyal, passionate and opinionated fans of any genre of music. This makes it very interesting when Country Music fans take to social media to express themselves. From time to time The Jimmy Kimmel show shines a light on some of the not-so-nice things people write and release special country music editions of mean tweets. 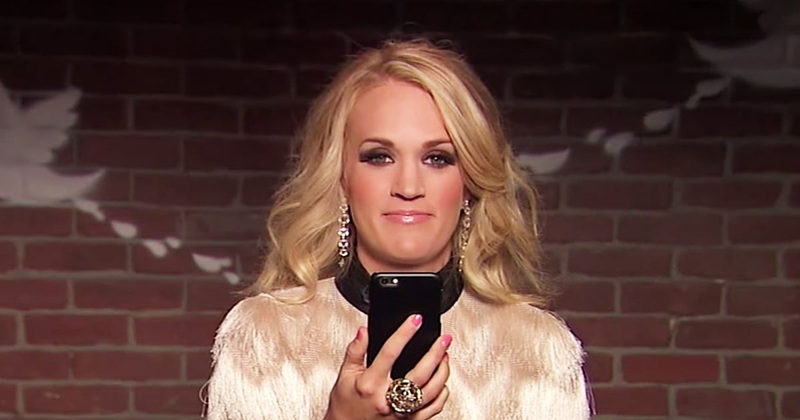 Watch all three editions of Country Music mean tweets and pick your personal favorite. Features Luke Bryan, Brad Paisley, Darius Rucker, Tim McGraw, Brett Eldridge, Kacey Musgraves, Willie Nelson, Thomas Rhett, Rascall Flatts, Florida Georgia Line, Jake Owen, Randy Houser, Scotty McGreery, Sam Hunt, Dan and Shay, Hunter Hayes, Chris Young, Carrie Underwood, and Little Big Town. The second all-country music edition of #MeanTweets featured Trace Adkins, Bonnie Raitt, Randy Houser, Cassadee Pope, Dan + Shay, Cole Swindell, Jana Kramer, Granger Smith, Miranda Lambert, Florida Georgia Line, Jake Owen, Little Big Town, Brett Eldredge, Hunter Hayes, Maren Morris, Willie Nelson, Dolly Parton, and Chris Stapleton. The Country Music Edition #3 of #MeanTweets featured Zac Brown Band, Cassadee Pope, Blake Shelton, Luke Combs, Randy Houser, Old Dominion, Trace Adkins, Darius Rucker, Dan + Shay, Jana Kramer, Chris Young, Florida Georgia Line, Lady Antebellum, Chris Stapleton, Jake Owen, Little Big Town and Justin Moore. As a bonus, below is the original Mean Tweets music addition that also features a few Country Music artists and bands as well as some Pop Music stars and Hip Hop artists.